Professional manufacturer of grinding equipment and grinding equipment. 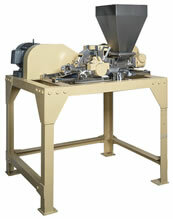 These large crushers can achieve products of uniform grain size with an extremely large capacity. Due to the rigid and compact design, they enjoy a wide range of applications in mass-production lines. The hopper can be equipped with a roll or plate permanent magnet or electromagnet to prevent magnetic substances being mixed. copyright® 1998-2018　MASUKO SANGYO CO.,LTD. All rights reserved.